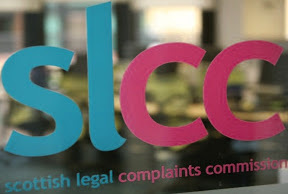 Scottish Legal Complaints Commission delayed publishing minutes to hide lay members resignations. 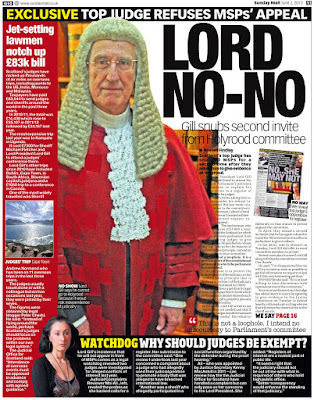 The Scottish Legal Complaints Commission was caught up in another scandal tonight as it was revealed that at least one, so far unidentified lay member wants to stand down, provoking a new round of Ministerial appointments of ‘lay members’ who are supposed to have no links to the legal profession, to the beleaguered law complaints body. SLCC Chair Jane Irvine. 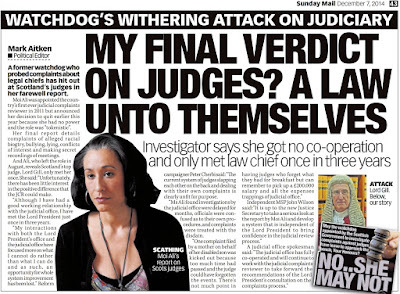 The Chair of the Scottish Legal Complaints Commission, Jane Irvine, refused give an explanation for the sudden departure of a lay member, nor did she wish to identify the individual at the centre of the latest crisis to hit the ‘independent’ SLCC. Ms Irvine delayed any announcement on the matter by making the enquiry a ‘freedom of information request’, which can take anything up to 20 days to receive a reply. 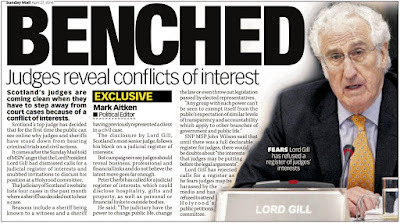 Well we have an interesting set of circumstances here, as it looks very much like the Justice Secretary will have to appoint new lay members to the Scottish Legal Complaints Commission, but where will these lay members come from ? Are the replacement lay members to be more stooges from the legal profession or other self regulatory bodies who know how to protect the guilty from their victims ? 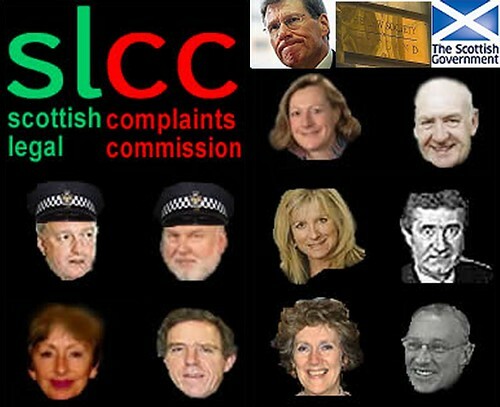 I fear that will be the case, as the initial round of appointments to the SLCC by the Justice Secretary, which I reported on here : Call for MacAskill appointments 'sleaze investigation' as revelations show Legal Complaints Commission member was subject of Police inquiry left a lot to be desired in terms of transparency and accountability. The SLCC board members : Do you want to join this bunch and be a lay member ? If you feel like contacting the Justice Secretary over the lay member positions at the Scottish Legal Complaints Commission, contacting the Justice Secretary as soon as possible, HERE. You can also contact the SLCC to offer your services as a lay member by email, HERE. 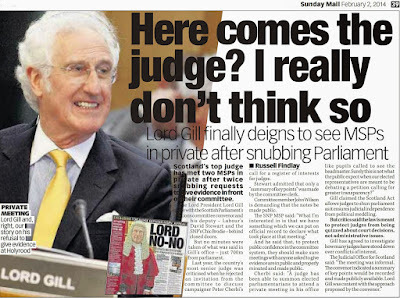 Just don’t expect to be taken on if you don't have relatives already in the legal profession .. which does seem to be one of the criteria for sitting on the SLCC and scoffing up to £350 a day in expenses. So how about keeping the public informed on these appointments ? 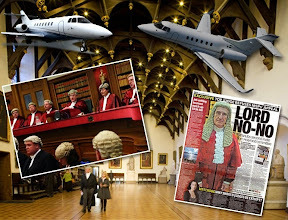 or is this another ‘secret squirrel’ operation to parachute in more sympathisers of crooked lawyers into the once claimed ‘independent’ Scottish Legal Complaints Commission .. which is now anything but independent. Scots accountants regulator ICAS have withdrawn their application for rights of audience. The choice of which professional should ruin your legal & financial affairs after you are dead, is to remain unchanged for now, with the revelation that the Institute of Chartered Accountants of Scotland have put 'on hold' their application to the Scottish Government for extended rights of audience to handle clients wills & probate services - work currently undertaken exclusively by solicitors. Scottish Government made a short admission on accountants rights of audience battle. A spokesman for the Scottish Government today said : "ICAS have put their application on hold meantime. We will proceed once we hear from them again. We have no correspondence from ICAS other than the application. We had a telephone conversation with them some months ago but have heard nothing since." A solicitor welcomed the news that ICAS had pulled their rights of audience application, claiming that accountants could not be trusted to handle the wills of dead clients, and warned the public there were little safeguards in the event a crooked accountant made off with the client’s money. 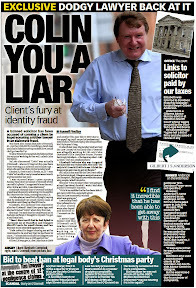 He said : "Considering accountants have little or no experience in the field of handling probate work in Scotland, and clients have even less safeguards in terms of protection from rogue accountants ruining their business, I doubt it would be in the consumer's best interests at this point in time to allow accountants to handle clients post-death affairs. I would therefore not advise a potential client or any of your readers to trust an accountant to 'wind up' their legal affairs according to their will." The case of Scottish Borders accountant Norman Howitt (pictured left) made it dangerous to allow accountants to handle a client's will. The solicitor went onto continue his critique and suggested accountants be barred from any involvement with wills : "On the basis of the now well known case involving your own family and the accountant Mr Howitt who was executor to your family’s ruined estate, I have advised and put off several clients from appointing their accountant as 'executor' to their will. After having read of Howitt’s actions in your case, I feel accountants and others close to the deceased's financial affairs should be banned from becoming executors on wills they are closely linked with or are handling via their firms either in a personal or business capacity." There are numerous reported cases where accountants, acting in the capacity as executor, have totally ruined the estates of deceased clients. Take it from me, there is as little protection against a crooked accountant robbing your life savings or ruining your legal affairs, as there is against a solicitor doing the same. Often I have found, from not only the case involving my own family’s legal affairs, but also those many more cases brought to my attention by you, the public, that crooked lawyers, and crooked accountants seem to make a good team taking as much money for themselves as they can get before actions are discovered. I would therefore recommended that members of the public who have already appointed an accountant as 'executor' on their will should immediately replace that person or their firm with someone who is a lot less involved in their financial or legal affairs and ensure whoever that person is, they are appointed with a set of specific instructions on what they can and cannot do, with a given timeline & cost not to be exceeded for the completion of their work. Scottish Legal Complaints Commission research reveals a trail of destroyed clients who attempted claims against lawyers. 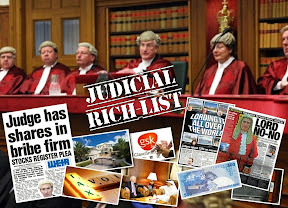 RESEARCH commissioned by the Scottish Legal Complaints Commission will this week reveal a catalogue of dirty tricks employed by the Law Society of Scotland, insurers Marsh UK and Royal Sun Alliance to defeat clients attempts to recoup millions of pounds of money stolen by hundreds of crooked lawyers who are still practising law in Scotland today. 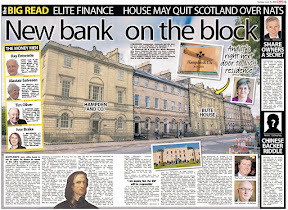 On Friday morning, 26th June, a presentation at the SLCC's Headquarters at the Stamp Office in Edinburgh, will be told of the experiences of members of the public who attempted to recover money and assets which solicitors had either stole for themselves or lost through providing poor & negligent legal service to their clients. 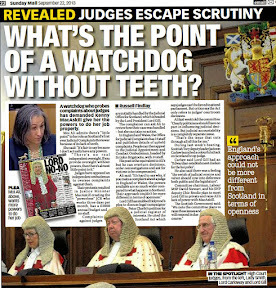 This research has been so feared by the Law Society of Scotland, it’s officials demanded early access to the material prior to publication, in an effort, some legal insiders say, is to censor the worst parts of evidence which will show the Master Policy to be “thoroughly corrupt”. 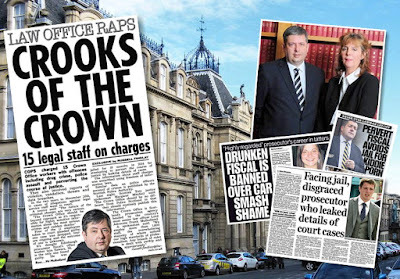 I reported on the Law Society’s attempts to gain early access to the Master Policy research here : Cabinet Chief Swinney intervenes in SLCC investigation of claims against crooked lawyers as Law Society 'fearing worst' demands early secret meetings. SLCC members will be given presentation on extent of failed claims & corruption within Law Society’s Master Policy & Guarantee Fund. Dr Angela Melville and Professor Frank Stephen, of Manchester University's School of Law will give a presentation to members of the Scottish Legal Complaints Commission on the results of their investigation into the workings of the Master Policy & Guarantee Fund client compensation schemes once touted by the Law Society of Scotland as being "the ultimate in consumer protection" but which evidence over the years has revealed, are little more than 'fronts' for a thoroughly corrupt regime bent on ensuring clients claims for compensation against thousands of crooked lawyers over the years, wither & die long before getting access to court. 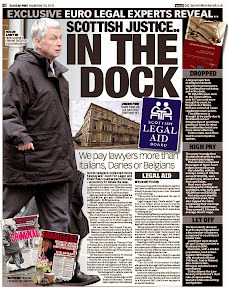 Former Law Society Chief & serving Sheriff Kenneth Pritchard intervened in claims to Master Policy. Among the revelations will be documents showing that key Law Society officials continually intervened in claims made by ruined clients to the Master Policy & Guarantee Funds, in order to delay by years, the processing of such claims, or even kill off attempts to obtain compensation stone dead. 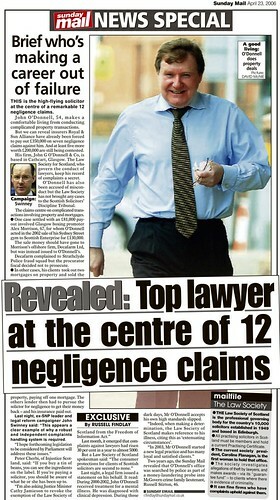 In some of the most severe cases, involving millions of pounds stolen by law firms from clients, Law Society chiefs such as former Law Society Secretary Kenneth Pritchard, were shown to have ordered solicitors to drop their clients for fear of massive payouts in negligence cases, despite ‘fixed’ Law Society investigations which covered up everything from fraud, to acts of potential criminality. 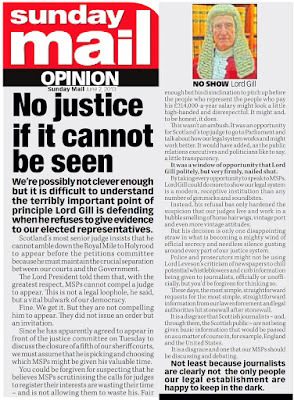 MSPs at Holyrood were intimidated by the legal profession into dropping constituents calls for fairer access to justice and resolution of their cases. 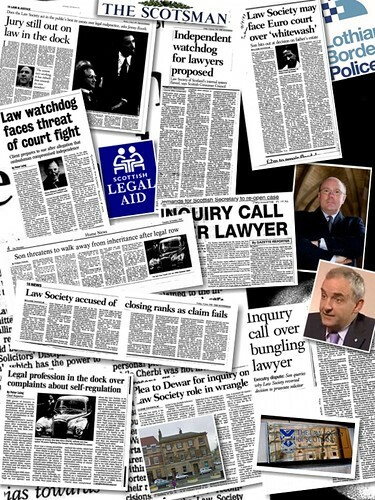 Indeed the power and influence of the Law Society of Scotland, backed up by the Scots legal establishment, has in the words of one MSP, “produced a vice like grip on public access to justice and even access to elected representatives”, where routinely, in cases where victims had called on their elected representatives for assistance, the Law Society would "call in" constituent's MSPs for meetings, and attempt to persuade them from dropping their constituent's requests to handle often severe cases involving crooked lawyers and the Law Society’s lack of will to do anything when faced with serious & substantiated complaints. Cabinet Secretary John Swinney was one of the few who stood up to the Law Society's insistence that all claims against crooked lawyers fail. 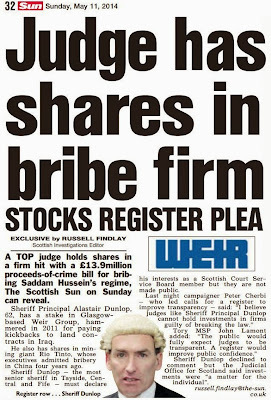 The Commission will also be shown videos which have been sent to the research team, revealing evidence from the current Cabinet Secretary for Finance, John Swinney MSP, that Law Society chiefs routinely intervened in claims & complaints involving crooked lawyers or challenges to the Law Society of Scotland to ensure no success for members of the public who had fell victim to notoriously corrupt law firms and individual solicitors. Cabinet Secretary John Swinney reveals Law Society Chief Kenneth Pritchard ordered law firms to drop clients who pursued crooked lawyers. Royal Sun Alliance Claims Manager Trevor Goddard admitted that only 1% of claims against crooked lawyers even make it to court. Cabinet Secretary John Swinney reveals the Law Society’s resentment to outside regulation of the Master Policy & Guarantee Fund. Ex Law Society Chief Douglas Mill falls into his Granny’s Grave as John Swinney reveals the Mill & his colleagues operated a policy for protection of crooked lawyers. Petition PE1033 was aimed at resolving failed claims against the Master Policy and crooked lawyers. Of course, the problems with the Master Policy & Guarantee Fund are easy to fix, if minds were focussed on admitting the truth and getting down to resolving the issues everyone knows about but just doesn't want to admit. I proposed a solution to this over two years ago, but the Law Society of Scotland wheeled out its big guns to kill it off at Parliamentary stage, where Petition PE 1033, which you can read more about here : Petition PE 1033 - A call for action, review & settlement for victims of the Scottish legal profession's injustice against client complaints. Perhaps someone else would like to take up Petition PE1033 and resubmit it ? 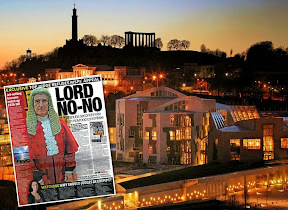 as I fear Holyrood is generally too prejudiced against my proposition to clean up the sins of the past of a very dirty legal profession who have grown fatter on the profits of injustice. 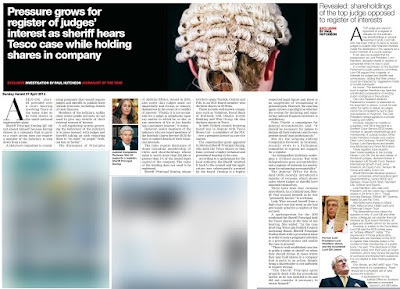 Law Society members are shielded by secrecy from FOI. When the law is twisted against people by those in the legal profession who use the law as a business model to make profit, and conceal activities that would be regarded as criminal activity if a member of the public did the same, the law itself is discredited. 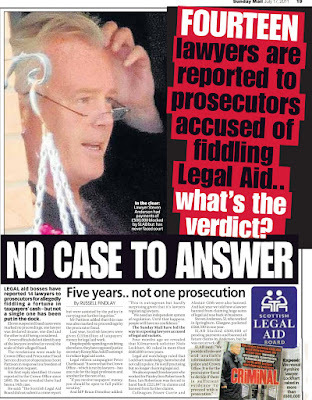 This is currently the case in the Scottish legal services market, where many solicitors & law firms are milking the public and their clients for vast sums of money for poor services, even fleecing clients at-will, and getting away with it due to the influence of the Law Society of Scotland in closing down any public interest reforms to regulation, access to justice, or attempts to consider cases of the past. Indeed things are currently so bad, you don't even have a right to know if your own lawyer has a criminal record ! The situation is, one could say, a mirror image of the battle which Westminster fought to keep everyone from finding out as we have now, that our politicians have been paying their expenses with our money and if it had not been for Freedom of Information, and the intervention of the national press, we would have been none the wiser because secrecy, can conceal anything. or write to him at : Kenny MacAskill MSP, Cabinet Secretary for Justice,The Scottish Government,St Andrew’s House, Edinburgh EH1 3DG. … and ask him to do his job to see Scots get a fairer deal in access to justice and transparency in legal services, which can be achieved in some part by removing the legal profession’s exemption from Freedom of Information legislation and making them more accountable to us. 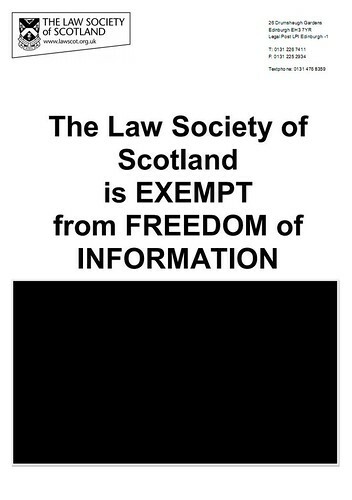 Law Society of Scotland officials are determined to prevent forced compliance with FOI. 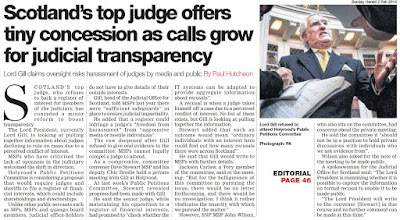 FOUR YEARS after the first calls were made to the Scottish Government to bring the Law Society of Scotland into compliance with Freedom of Information legislation, attitudes apparently remain unchanged at the Justice Department over calls to force greater transparency & accountability on the lawyers regulatory, despite the fact the new regulator for complaints against Scottish solicitors, the joint taxpayer-lawyer funded Scottish Legal Complaints Commission is itself FOI compliant. 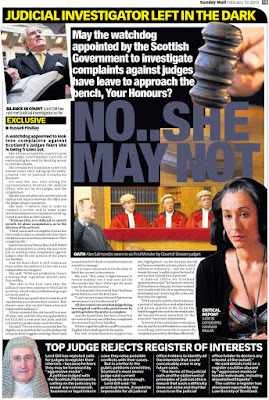 Justice Secretary MacAskill is rumoured to be 'bitter' over calls to make lawyers comply with Freedom of Information. 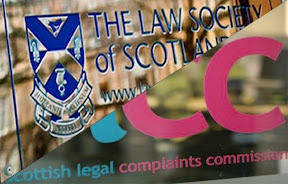 The Scottish Government's three year go slow on bringing the Law Society of Scotland into the scope of Freedom of Information legislation, has today been attributed by sources within the administration to problems of bias in the Justice Department itself, with civil servants being described as 'very angry' that members of the public should even be calling for such reforms. The Justice Secretary himself, aware of publicity surrounding the secretive nature of the Law Society is also rumoured to be "very bitter" that critics of the legal profession have even dared suggest the Law Society be brought within the scope of Freedom of Information legislation. A legal insider today said : "Officials at the Justice Department are less than pleased that members of the public, campaign groups and journalists have made enquires on the lack of progress of reforms in legal services. Occasionally, civil servants have themselves hit out at critics of the slow pace of justice reforms, with less than gentlemanly outbursts, due to impressions given the Justice Department itself is now covering up for corruption, and even perhaps criminality in the legal profession itself." 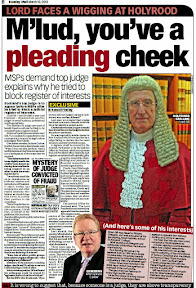 He went on : "The Justice Secretary himself, is well known to be vehemently against anyone who dares criticise his colleagues in the legal profession, to the point that any idea put forward from outside the legal establishment to 'improve' public access to justice, or, as in this case, making the legal profession compliant with freedom of information laws, MacAskill has set himself diametrically against, simply out of bloody mindedness." 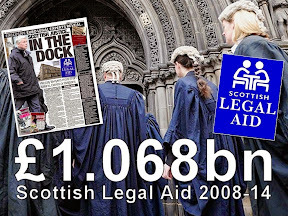 The Scottish Government are bitterly resisting reforms to the legal sector. It seems somewhat at odds to me, with the era we are now living in, where secrecy, self regulation and the corruption & greed which both issues seem to breed, have virtually wiped out our main banks, trust in the financial sector, and even trust in politicians not to over claim on their expenses accounts, that the Scottish Government are still so bitterly resisting making the legal profession compliant with Freedom of Information laws, and also remain so opposed to implementing fully independent regulation of solicitors, to safeguard consumers best interests. This resistance on the part of the Scottish Government to process any reforms of the way regulation and client business is handled by the Law Society of Scotland, is an almost perfect mirror image of the resistance from the legal profession itself, who are determined to remain immune from FOI legislation, and virtually all other forms of independent oversight which may very well end up revealing an even greater scale of corruption within the Scots legal sector which might take critics such as myself by surprise. John Swinney revealed Law Society Chiefs threatened anyone who called for regulatory reforms. 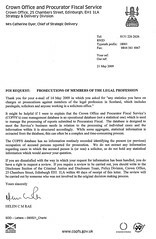 Indeed, while the first calls for making the Law Society of Scotland comply with Freedom of Information laws were being made, Cabinet Secretary John Swinney MSP, then in opposition, revealed that the Law Society’s then Chief Executive Douglas Mill was busy attacking such ideas, even issuing open threats to the Financial Services Authority and any future regulator who might consider taking a stick to the vast sea of corruption which surrounds areas such as the Law Society's discredited Master Policy & Guarantee Fund client compensation arrangements, which some liken to money laundering operations. 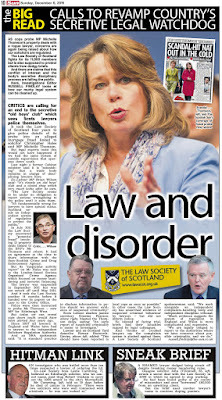 SLCC's Chair Jane Irvine, supports the idea of making the Law Society comply with Freedom of Information. 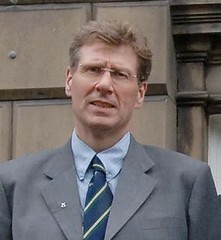 However, while Justice Secretary Kenny MacAskill continues his go slow on making the Law Society comply with Freedom of Information legislation, a growing number of consumer groups and even some from within the legal establishment itself, such as the Chair of the Scottish Legal Complaints Commission, Jane Irvine, are supporting the idea that the public interest would be best served by making the legal profession's governing body FOI compliant. 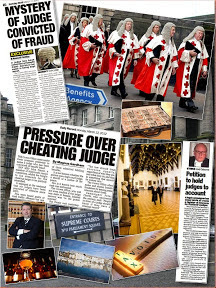 Scottish Legal Complaints Commission has suffered several scandals as a result of FOI disclosures. 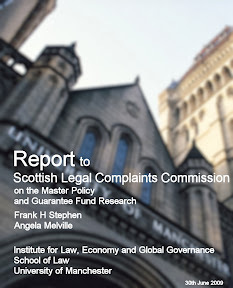 Admittedly, the Scottish Legal Complaints Commission is no angel itself, when it comes to the Commission's own compliance with Freedom of Information laws. In some cases, the SLCC has chosen (allegedly through Ministerial direction) to censor disclosed material to particular journalists, and on other occasions, has apparently been authorised to lie in FOI disclosures. 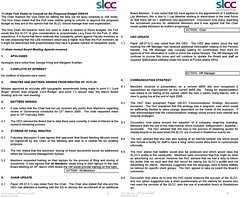 You can find some more good FOI scandals involving the SLCC HERE. 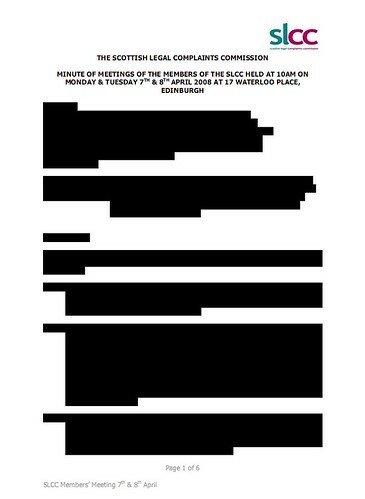 SLCC blacked out FOI disclosures in true Westminster style and Law Society might do the same if made FOI compliant. 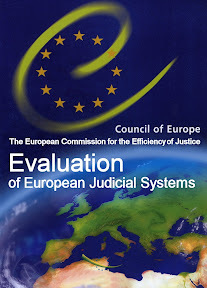 However, while the Information Commissioner is investigating these breeches of FOI laws by the SLCC, and has already criticised the commission in a number of decisions for their poor practices, FOI has brought us an invaluable insight into the way the legal profession will co-opt independent organisations set up as a result of legislation to look at client complaints, and perhaps even more importantly, has also shown us the steps some officials take, and the lengths some are willing to go, to stifle public debate and calls for legitimate reforms which are certainly in the public interest. As politicians are subject to Freedom of Information laws, as the Police are subject to Freedom of Information laws, as indeed are many other public bodies & services, including local & national Government are subject to Freedom of Information laws, then so also must the legal profession be made subject to Freedom of Information laws, a reform which is definitely in the public interest. Westminster publishes MPs expenses online with most details blanked out. 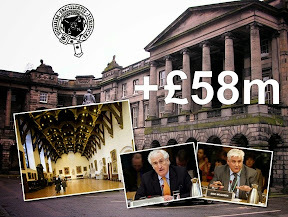 The House of Commons has finally published MPs expenses online, however many of the details have been blanked out, because while we as taxpayers are paying MPs salaries and their expenses, we are it seems not entitled to see what we are paying for, or by the looks of it, any returns the country actually gains by allowing politicians to claim for all & sundry from us, the taxpayer. An MP’s British Telecom reminder blacked out – would you pay a bill if it landed through your letterbox in this state ?. 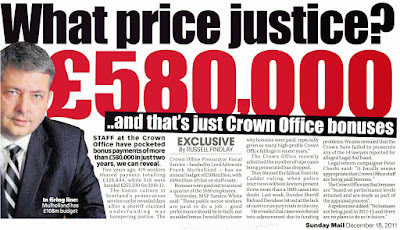 While members of the House of Commons seemingly can get anything & everything paid for by the taxpayer, from mortgage interest, to second homes allowances, to telephone bills to the removal of moss from their umpteenth house, or duck houses and repairs to swimming pool boilers .. the ones paying it – us, are not entitled to see exactly where the money is going and what the justification is for their huge expenses to the country, particularly in these crushing financial times. For a couple of samples of today’s publication of expenses from Westminster, via Freedom of Information (in other words, the blacked out version, as opposed to the Telegraph ‘warts and all’ version) we see among the Scottish contingent, Alex Salmond claiming for mortgage expenses and a rather costly envelope folder, as well as curtains & bedding .. with Scottish Conservative MP David Mundell keeping the First Minister company on mortgage expenses, which I'm sure probably most of the country would like to join in with, having mortgages, bedding, curtains, food, and letter folder contraptions paid for out of thin air out of other people's taxes & hard work. If it had not been for the Telegraph newspaper, we would have been none the wiser on crooked politicians expenses claims. 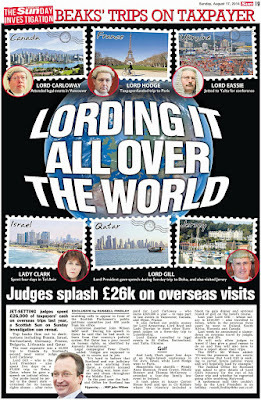 Exposing this organised ‘thieving’ from the country of course, fell to the Telegraph newspaper, rather than Freedom of Information legislation, because as we now see in today’s release of expenses information from Westminster, it would not be possible to see who had been flipping homes, and who was claiming what for which property. 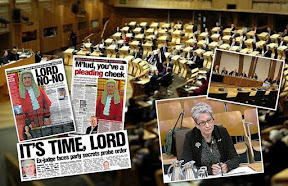 It is therefore clear that FOI legislation will have to change because it is being used to deceive rather than empower, just as we have seen the Scottish Legal Complaints Commission use FOI to cover up scandalous workings within its increasingly bizarre operations of allegedly regulating the Scottish legal profession. 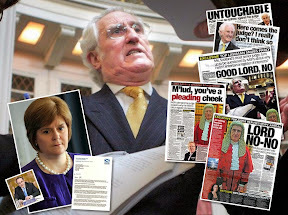 MSP David McLetchie was among those politicians caught out at Holyrood claiming thousands for expenses. MSPs might like to think they are whiter than their Westminster counterparts, but as we know here in Scotland, that is most certainly not the case. 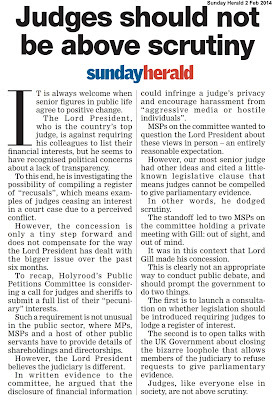 While MSPs expenses are now published online, again, it took pressure from newspaper investigations such as those in the Sunday Herald to force the changes at Holyrood which Westminster will now have to go through. The expenses claims of every MP for the past four years have been published, but with some key details blacked out. Commons authorities have published the details after a long-running Freedom of Information battle. The addresses that claims relate to - and correspondence - have been removed on privacy and security grounds. This means it is not possible to see if MPs "flipped" second homes - a key part of the Daily Telegraph's revelations from its leaked version of the data. MPs have said some details, like addresses and travel patterns, have to be withheld for security reasons . But other details have been removed in the official version such as Prime Minister Gordon Brown's claims for his Sky television subscription - despite the fact it was published last year, also under the Freedom of Information Act. The uncensored details obtained by the Daily Telegraph have led to weeks of revelations and a slew of resignations from MPs. On Wednesday Treasury minister Kitty Ussher stepped down amid reports that she changed the designation of her constituency home to avoid capital gains tax. Ms Ussher said she acted within the rules but wanted to protect the government from further embarrassment amid public anger about expenses. The BBC's political editor Nick Robinson said that if the full uncensored claims had not been leaked to the Telegraph, then MPs like Miss Ussher would still be in their jobs. Andrew MacKay - From the official receipts it would not have been possible to know the Tory MP claimed for a second home without having a main constituency home. 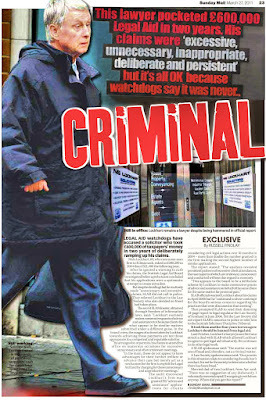 Margaret Moran - The Labour MP who claimed £22,000 for dry rot on her second home. The receipts do not show her second home was in Southampton -100 miles from her Luton constituency. Sir Peter Viggers - Tory MP who tried to claim £1,645 for a "duck island", the official receipts show no evidence of the unsuccessful claim. Hazel Blears - The former Labour minister claimed second home expenses for three different properties in a single year but the redacted receipts do not show this as addresses are blacked out. Heather Brooke, one of the campaigners who brought the Freedom of Information case, told the BBC the official publication was a "substandard version". She pointed out the High Court had ordered that second home addresses be published - MPs rejected this in a later Commons vote, arguing it would jeopardise their security. "It's the only way to police effectively whether there is a second home and whether the mortgage exists whether it's been paid off or not and they are still claiming. It's really the only way we can hold them to account on that second home allowance." She said the security argument had been "totally discredited" adding: "I can see that avoiding embarrassment has been the key motivating factor of what's been deleted." And Maurice Frankel, of the Campaign for Freedom of Information, also said the official version was a "very poor substitute": "The mood of the House of Commons was that they did not want any of this information to be published and, failing that, as little as possible." But cabinet minister Hilary Benn told BBC Radio 4's Today programme: "The argument for keeping bank details, phone numbers and addresses confidential I think is a fair one." But he said the system needed to change: "That's why we've seen seismic changes, that's why Parliament has already taken steps to alter the rules why Christopher Kelly's committee will look at what the new system will be." He added the problems were the result of self regulation - now expenses would be audited independently. For the Conservatives, shadow Commons leader Alan Duncan said: "I think the black ink is justified where it is things like ex-directory phone numbers ... and personal details and bank accounts." He said changes had been made to ensure MPs could not "play around with the second home address in order to extract as much money as possible out of the system". But he said "at the very least" addresses should be properly audited. "Whether the exact address should be put up which would allow people to walk up your front drive I think is a grey area - but the verification of the house and the consistency of the house that is registered is important." More than a dozen MPs have said they plan to stand down since the furore over expenses began and many have had to repay money - more than £300,000 has been repaid. Claims made by all 646 MPs under three different allowances since 2004 have been published alphabetically on the Parliament website with thousands of receipts made available in a series of PDF files. The Telegraph's reports focused largely on the additional costs allowance, designed to cover costs associated with second homes. The paper highlighted the practice of "flipping" - by which some MPs switched the designation of their homes and claimed allowances for several properties over the four year period and other claims that were within the rules - but questionable. Last year, the Commons agreed to blank out certain information considered sensitive including addresses and all communications with the Fees Office. MPs have been able to suggest further exclusions. 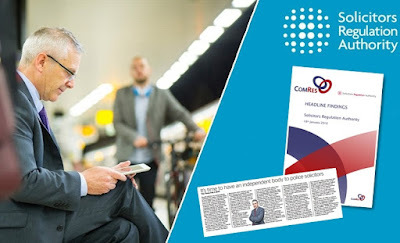 Other information published on Thursday includes the incidental expenses provision for office costs and the communications allowance - Parliament had been ordered to publish them by the High Court. Labour has referred MPs accused of making questionable claims to an internal disciplinary panel, which has barred five MPs from standing at the next election. The Tories have asked all its MPs to submit their claims to an internal panel for scrutiny, with a handful of MPs either being forced to stand down or choosing to retire. The furore has led to interim changes to the second homes allowance while the Committee of Standards in Public Life is holding an inquiry into expenses and will recommend changes to allowances rules. Gordon Brown has said oversight of MPs expenses must be handed over to an external regulator as part of a root and branch reform of Parliament. The Daily Telegraph's assistant editor Andrew Pierce told the BBC they would publish the entire list of claims submitted by the cabinet on Friday and every MP's expenses on Saturday - to allow people to draw their own conclusions about what had been "censored". "I suspect it could be that more MPs will be considering their position and maybe their party leaders will be considering whether they are really fit to be an MP," he said. Scotland's courts have been criticised for protecting legal firms against challenges by barring clients from courts. A recent addition to the list of vexatious litigants in Scotland, now numbering six people, has drawn attention to the fact that most of the cases on the list appear at some stage, to involve issues relating to the legal profession, with even allegations of interference in the judicial process itself, leading to criticisms today that the Scottish courts are protecting lawyers from challenges by clients who cannot obtain legal representation due to the fact that most lawyers will not take on legal actions against their colleagues. 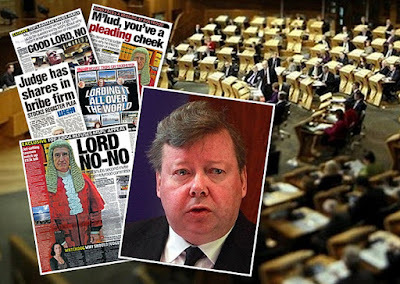 As the Scotsman reported yesterday, the latest addition to the list of vexatious litigants follows a judgement from Lord Reed in the case of the Lord Advocate v Andrew McNamara, relating to cases raised by the pursuer dating back to 1996. 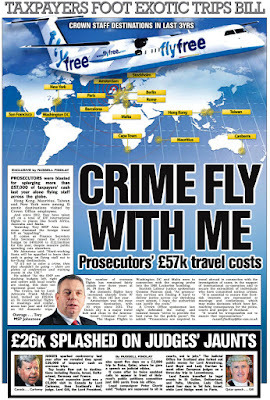 Among those mentioned, as the Scotsman reports, in the cases brought by Mr McNamara, were Edinburgh legal firm Tods Murray who were suing McNamara for fees, and Glasgow legal firm Levy & McRae, who formerly themselves represented McNamara in his own actions against Tods Murray. 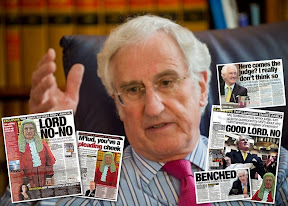 The Scotsman goes on to report that the cases grew to involve the former First Minister Henry McLeish - himself forced to resign over secretly renting out his offices to law firm Digby Brown, another Glasgow legal firm - Alexander Stone & Co, and Sheriff Peebles. 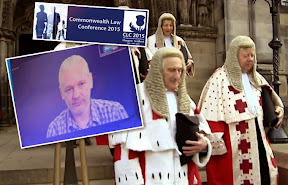 The glaring consistency in all those named in the various legal actions, is of course, they are all members of, or have some connection with the legal profession. 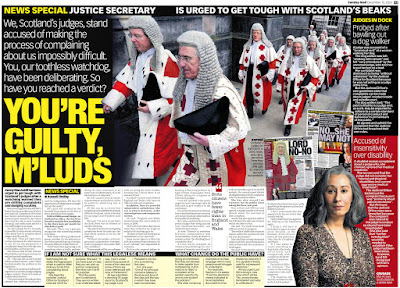 Law Society of Scotland ‘strangely silent’ on public being barred from courts when cases involve challenges to lawyers. 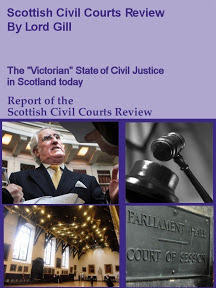 A legal insider today alleged that ‘vexatious rulings’, quietly taking place without protest, are damaging public access to justice in Scotland, and appear to be being used by the legal establishment as a last line of defence against people who find themselves unrepresented by counsel solely because their cases, which are often complicated, involve challenges to the legal profession’s way of doing things. 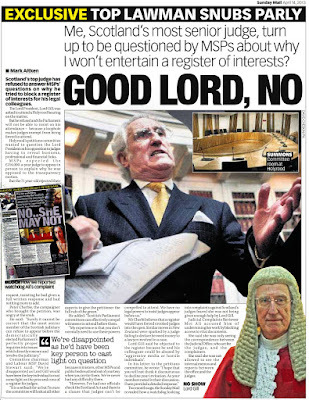 He said "What is glaringly obvious in the list of vexatious litigants on the Scottish Courts website is that most of the cases, the details of which are peculiarly not listed in full to give readers any leads on why such rulings have been applied, seem to have some involvement with the legal profession in some way, such as challenges to fees, poor work, misrepresentation, interference in the judicial process itself, and even involvement with the Law Society of Scotland." 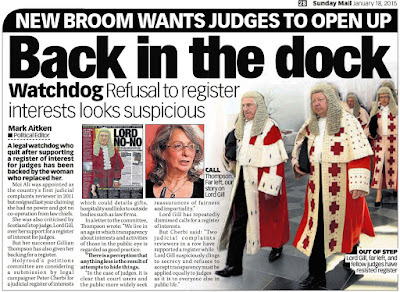 He went on : "One could easily conclude the courts are closing the door on access to justice for anyone who is challenging a legal firm, and who also find themselves coincidentally lacking legal representation because of an organised boycott against their case by solicitors and the Law Society of Scotland." 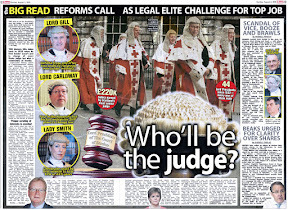 Cabinet Chief John Swinney revealed Law Society chiefs ordered solicitors to drop clients. The lack of legal representation of individuals who find themselves the target of 'vexatious litigant' rulings appears to be no accident, as Cabinet Secretary John Swinney revealed during a debate in the Scottish Parliament that Law Society chiefs have written to solicitors advising them "to drop clients", in cases which usually involve solicitors initially representing clients against other legal firms in complicated legal actions, where complaints of negligence, poor service, or falsified fee demands, and corruption against clients have been detected. 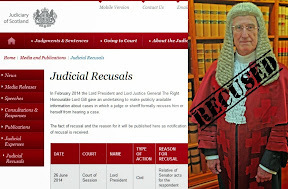 The usual pattern of obstruction then develops in that clients find themselves suddenly unrepresented nearing their proof hearings in Court after orders to cease representation are handed out by the Law Society, or as reported in some cases, secret deals are worked out between the legal firms to drop the pursuer a few days before the court case is due to start. Cabinet Secretary John Swinney reveals Law Society Chief Kenneth Pritchard ordered legal firms to drop clients, leaving them unrepresented in court, like McNamara. Justice Secretary Kenny MacAskill 'should make guidelines’ to Judges on barring people from access to court. 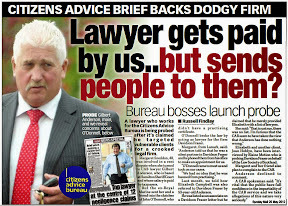 An official from a consumer organisation today said that while Scotland has so far escaped using the ruling to bar so many people from the courts, she believed it was time for the Justice Secretary to step in and ensure that members of the public are not being barred from access to the courts simply because their cases involve challenges against 'crooked lawyers' or involved claims against other professionals. 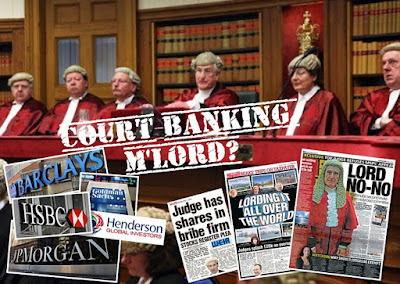 “It does appear to me that many of the cases so far which have been denied a hearing in the Scottish courts seem to involve problems with the legal profession, and a determination on the part of some that no issue of an unrepresented pursuer's case receives a fair hearing, for fear of upsetting the balance of power in the Scots legal world which most people now accept is heavily tilted against the consumer by vested interests." 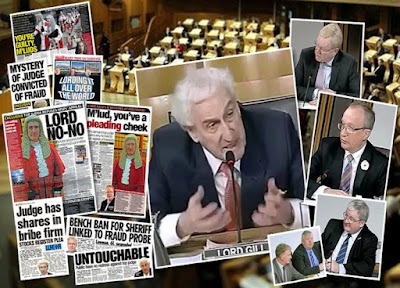 As the evidence clearly shows, the court has become no place for challenging a crooked legal firm – because everyone in the court, except the client, is a member of the Law Society of Scotland .. even the judge. A new independent venue must be developed for such cases, as the court has clearly demonstrated time & again it cannot be trusted and cannot be impartial enough in such instances where a client has been maligned by one of their colleagues, to deliver a just verdict while determining exactly the course of events which led to the litigation in the first place.